Feyre survived Amarantha's clutches to return to the Spring Court—but at a steep cost. Though she now has the powers of the High Fae, her heart remains human, and it can't forget the terrible deeds she performed to save Tamlin's people. Nor has Feyre forgotten her bargain with Rhysand, High Lord of the feared Night Court. As Feyre navigates its dark web of politics, passion, and dazzling power, a greater evil looms—and she might be key to stopping it. But only if she can harness her harrowing gifts, heal her fractured soul, and decide how she wishes to shape her future—and the future of a world cleaved in two. With more than a million copies sold of her beloved Throne of Glass series, Sarah J. Maas's masterful storytelling brings this second book in her seductive and action-packed series to new heights. I just finished my new all time favorite book. I have no words… When people say that Sarah J. Maas is a great writer, they are NOT lying. And as soon as I finish this review, I’m picking up A Court of Wings and Ruin. This book had me in tears, it had me laughing and it definitely had me angry. By the way, I officially hate Tamlin. I loved him in the first book but I mean, there is no going back now. And Rhysand is the most perfect and amazing man EVER! He can do no wrong in my eyes. A Court of Mist and Fury starts off where A Court of Thorns and Roses left off. Feyre is having a lot of nightmares and a hard time coping with what she did Under the Mountain. Tamlin is also having nightmares as well but they won’t talk to each other about it. They are due to be married soon but the moment she is walking up the aisle, Rhysand comes to fetch for her. She is still in the bargain with Rhysand and she goes to him for one week, every month. Rhysand brings her there so she can learn to read and work on shielding her mind. But Tamlin is too worried about Feyre’s safety to even let her roam the palace grounds without guards and decides to lock her up in the house. Feyre breaks down with rage and fury and is swept away by Mor (Rhysand’s cousin). She is brought to the Night Court and Rhysand tells her she can leave as soon as she says the word. She decides she wants to stay. Rhysand takes her to Velaris, his home that he has kept secret and protected for five thousand years. And Feyre is in love with the place. Feyre wanted to train to strengthen her new Fae powers but Tamlin never allowed her to but in Velaris she is trained by Rhysand and his inner circle. Rhysand warns that war is coming and Feyre could be the savior that they need. All the characters in this book are incredible. Rhysand (swoon), Cassian, Azriel, Mor, Amren, Feyre, even Lucien is still on my good side. But not Tamlin. I don’t want to talk about Tamlin. We even get to see Feyre’s sisters some more and they are great as well. I love the inner circle and how close they are as friends. Velaris sounds so amazing, I wish it were a real place that I could go to right this instant. But back to Tamlin… I LOVED him in the first book and I knew from all the posts I’ve seen, that I would not like him after A Court of Mist and Fury. And I don’t like him anymore. I understand why people hate him. But Rhysand is just so incredible that the book makes him look like the opposite of Tamlin so maybe that’s why everyone hates him so much. Rhysand is literal perfection. How do you compete with that? Obviously this story was amazing, the world was great and all the action had me biting all my nails off. But I also loved seeing Feyre grow as a character. She has come such a long way and I’m so proud of her. If you haven’t read A Court of Thorns and Roses, go pick it up right now so that you can read this one. I promise you won’t be disappointed. And if you are, then I’m sorry but I don’t know what else to tell you. Thank you to everyone who recommended this book to me. If it weren’t for bookstagram and booktube and bloggers, I probably would not have read this. So thank you for finding me my favorite book of all time. GO READ THIS BOOK! SPOILERS! 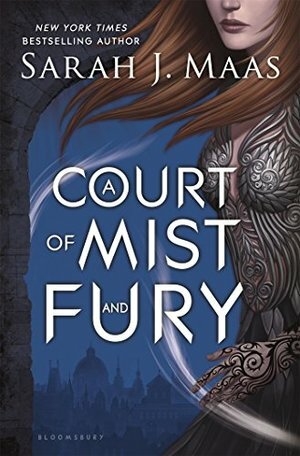 Also this is a low quality review !I gave A Court of Mist and Fury(ACOMAF)four stars. The writing was per usual stunning and gave good description of the wonderful world the characters live in. I love how Feyre developed throughout this book becoming much more strong and sure of herself. The side characters were written in well for the most part. My exception to this is Ianthe. I felt she was very rushed. She of course is sort of a villain (which we learn in the end) but in the beginning they just started mentioning her and I was like “Who?” It took me a while to piece it together. Lucien really disappointed me in this book and really came of weak and had no backbone (I’m not saying he was written wrong but I disliked him as a character). I’m hoping for him to redeem himself in ACOWAR especially since ELAIN is his mate! I’m so excited, they totally fit. Nesta is slowly but surely becoming one of my favorites. I love her fire and her character and how she would destroy the whole world if her sister was in the slightest bit of danger. It would be interesting if Elain and Nesta got powers now that they are High-Fae. I look forward to their character progression in the next book. Now to my favorite, RHYSAND. Let me take a moment to fangirl *inhales* RHYS IS THE BEST HIGHLORD AND HIS ABSOLUTE CUTENESS SUFFOCATES ME. He honest to goodness may be my favorite male character ever. He is written so well. You really understand why he has done all these things and you love him for it. He is so good to Feyre and treats her like a woman should be treated, not like a pet *cough* Tamlin *cough*. And we can’t forget Mor, Amren, Azriel, and Cassian. That whole dynamic is absolutely beautiful. I love how all six of them are just a big happy ol’ family unit. Individually they are great but together, em, watch out world. THEY ARE FANTASTIC. Aside from the characters I really enjoyed the pacing. It was never dull. I especially loved the fight scenes and pretty much any time Feyre used her powers. This book was so so good. I did give it a four though because I felt some things were repetitive and I didn’t like how Ianthe was added in. But other than that this book was phenomenal.